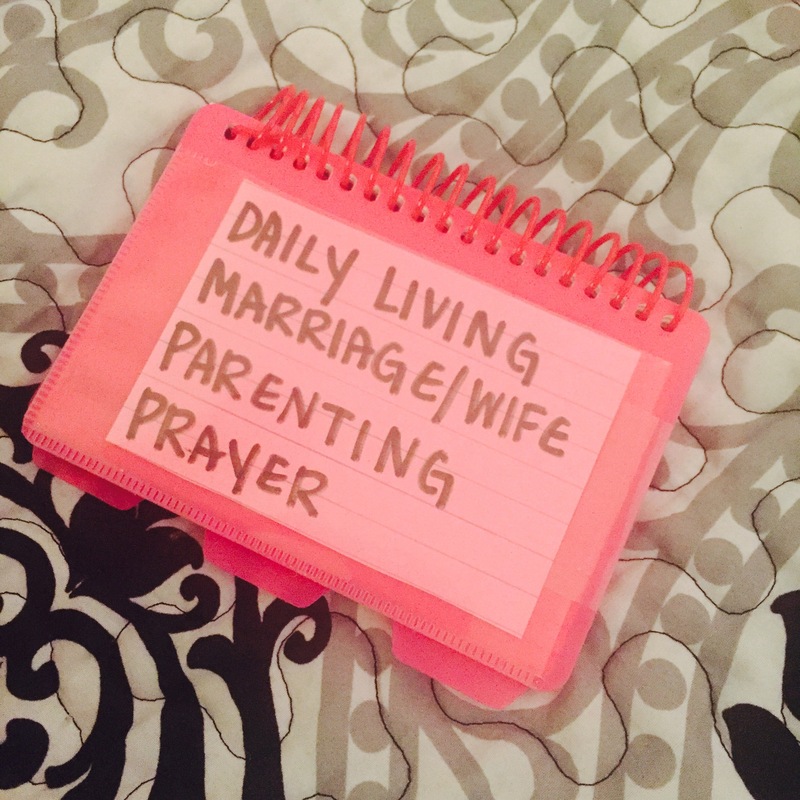 Last week on the blog, I posted Moving Beyond the Bible Checklist. Thank you for the comments, likes, and shares on that piece! What a blessing to see those responses! I wanted to talk about one of the approaches discussed in that post. I mentioned using small spiral notebooks to categorize scriptures. These notebooks have really helped me mature in my Bible literacy and application. I would like to show you what they look like and explain how I create and use them. Maybe, then, we can be using these notebooks filled with truth, together. This first picture is the front cover of one of my notebooks. The dimensions are that of an index card. You can use any size notebook you like, but this size is convenient to keep in a purse, diaper bag, or car cup holder. In the second picture below, notice the notebooks I use have tabs. This makes categorizing themes of scriptures easier. We have bought a notebook, it’s a pretty color, has useful tabs, and it’s empty. The first thing I recommend doing is contemplate what areas of your life need prayer, guidance, and scripture right now. I’m at a stage where I’m having to balance my marriage, toddler, job, and Bible reading. Some days are tiring and difficult. Thus, I decided to make a notebook with categories/themes that cover these areas of my life. Your notebook themes might be similar or include tabs labeled: your job, health issues, our nation, being thankful, etc. List the chosen themes on a sticky note and placed that on the front of the notebook (see first picture above). This list is a guide to the order of the tabs within. For me, the first tab consists of scripture for daily living, the second tab covers marriage, the third parenting, and the last prayer. As a starting point, I did research on the internet for scripture related to each theme. I then wrote down the scriptures, in the notebook, under the correct tabs. After writing down scriptures for the main themes we are facing in this stage of our life, it’s time to use these scriptures in the way God intended! Prayer is important and most effective when combining it with God’s words of truth. Each time we go to pray, we need these notebooks with us! 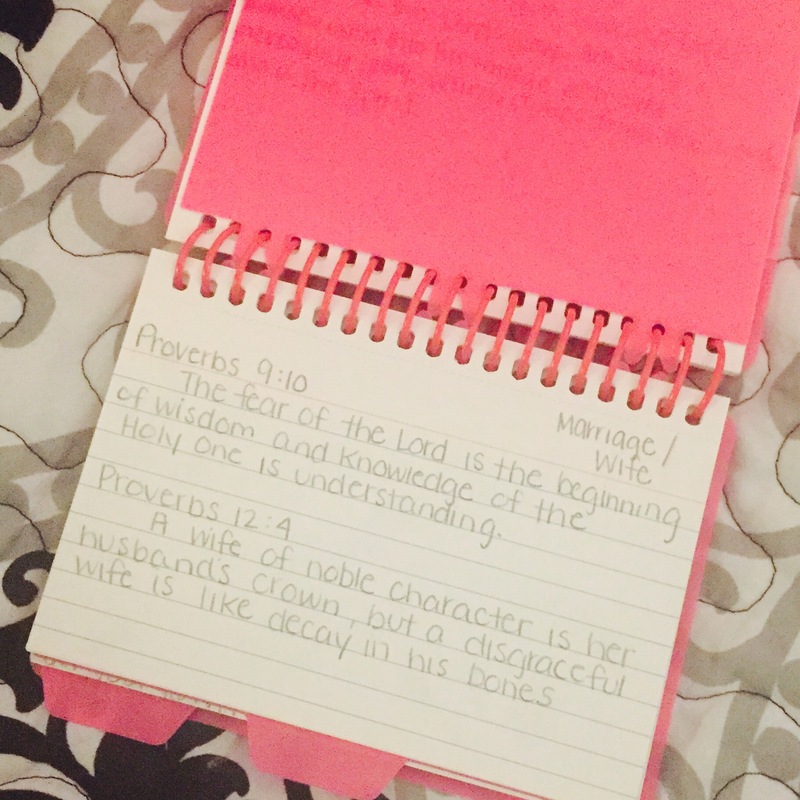 For example, when I pray for my marriage, one verse under the marriage tab of my notebook is Proverbs 21:19. This verse reminds me to not be a quarrelsome wife, and I pray to God to help me recognize when I begin or want to nag my husband. I ask that the Holy Spirit stop my mouth and mind from being both quarrelsome and nagging! These notebooks are not just reminders of what to pray for, but they lead us to prayer, even when we are unsure what to pray. When I’m having a particularly difficult day with my very independent toddler, but I’m unsure of what to pray or do about it, I go to the parenting tab, flip and read until a verse or verses speak to me as only God can make happen! The verses I have gathered under this tab guide me and remind me that my husband and I do not have to parent alone. We have God, the ultimate Author of the best parenting Book there is. God’s instructions and praying over my daughter with that instruction on my tongue, works! I am living proof that the process of integrating specific scripture with prayers bring about results that are pleasing to God. These notebooks make that process easier! We must not forget to add to our notebooks. As we read the Bible, participate in a Bible study, or come across a verse of truth that reminds us of a notebook theme- we need to go write it down! As our lives change, so might our notebook themes, and that’s to be expected! New notebooks, themes, and life changes are inevitable. Thankfully, the living and perfect words of God are permanent and forever!